One of my cooking mottos would have to be French onion all the things! Why? 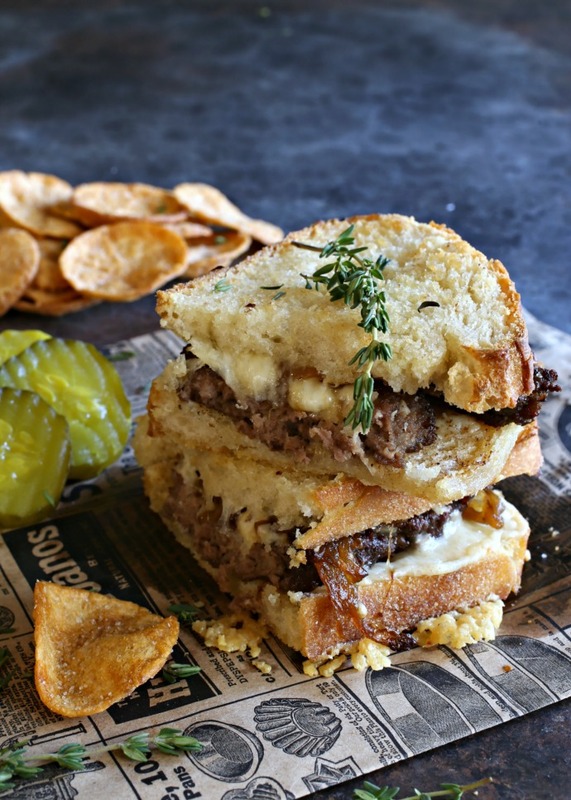 Because the combination of beef, Gruyere cheese and caramelized onions is awesome. Sure, it's great in soup but it's just as great minus the soup. 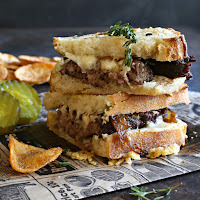 Patty melts are already awesome so giving them the French onion twist just makes them even more so. 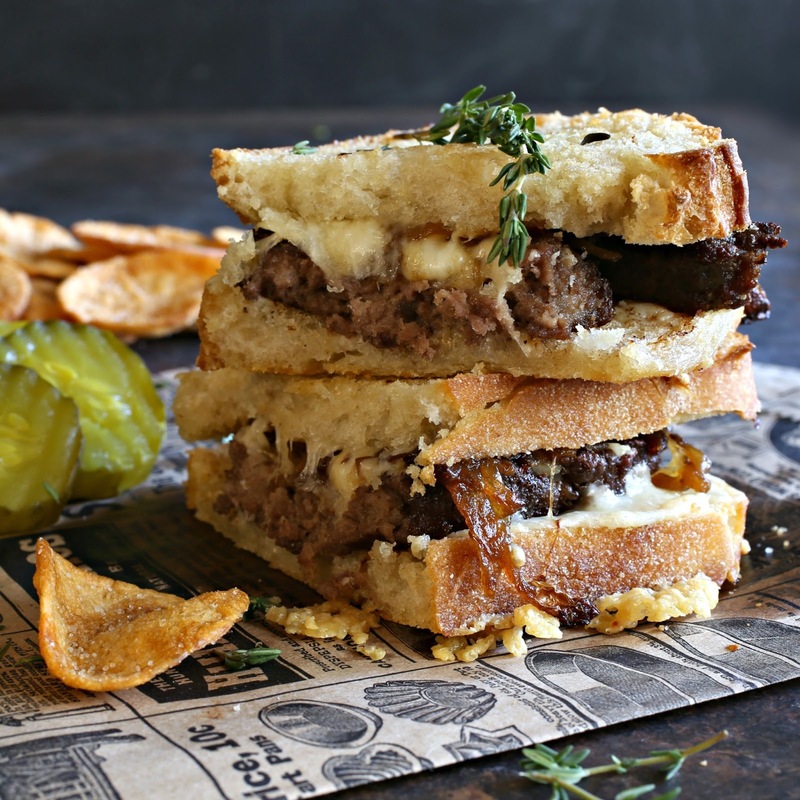 A patty melt is really a hybrid of a burger and a grilled cheese sandwich and it's the best of both worlds. 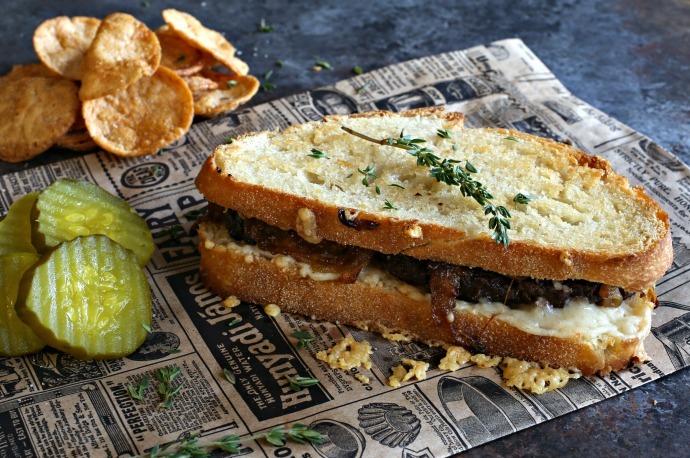 It's normally topped with caramelized onions and cheese, served on rye bread. Since I was going with a French onion theme, I used my favorite crusty French bread and Gruyere cheese. I also gave the onions a boost with Worcestershire sauce and fresh thyme. It's a simple dish with a big flavor. I ate it with delicious, slightly sweet bread and butter pickles but those small French pickles would be great here as well. Add some crunchy chips and your favorite beer and this is a dinner you'll want to repeat often. Enjoy! Add the butter, olive oil and onion to a large skillet or cast iron pan. Cook on medium heat, stirring occasionally for about 20 - 30 minutes or until the onions are caramelized and a light golden brown. Stir in the Worcestershire sauce and thyme leaves. Remove the onions to a plate and add the beef patties to the pan. Season with salt and pepper and cook to your desired doneness. Butter both sides of the bread slices and toast either in a separate skillet, a toaster oven or a regular oven at 400 degrees for about 10 minutes. You want them to be a light golden brown. Add equal amounts of the shredded cheese to each slice of bread while it's still hot. Top with the burger and a large spoonful of the onion mixture. 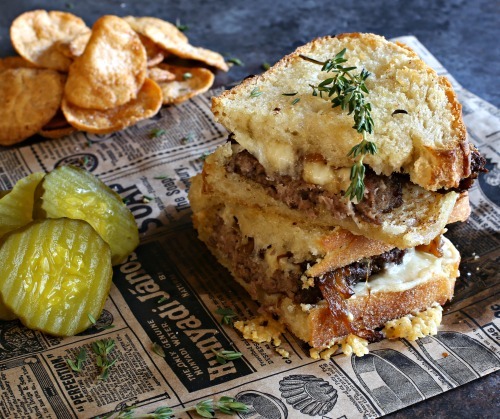 Press the second slice of buttered and cheesy bread down over the burger and onions. Serve hot with pickles and crispy chips. I fully love and endorse that motto-please french onion all the things so I then too can reap the benefits. Aghhh I love it!